When I saw the name Sir John Trevor in the press, it rang a bell and I therefore looked in the list which the Castle Rising History Group had prepared documenting MPs who had represented the Pocket Borough of Castle Rising. In the parliament of 1673-1677, the so-called “Cavalier” Parliament, Castle Rising Borough was in the “pocket” of Thomas Howard, Duke of Norfolk, who among his various titles was also Lord of the Manor of Castle Rising from 1652-1677. The two members representing the Borough in the Cavalier Parliament were Sir John Trevor and Samuel Pepys. The Dictionary of National Biography reports that Sir John (he was knighted in 1671 by ingratiating himself to Charles II) had acquired the seat at Castle Rising for £60. His involvement with Castle Rising was short lived and there is no evidence that he ever visited the Borough. In the next Parliament he represented another Pocket Borough Bene Alston in Devon. A Welshman, he finally represented his own region in 1681 by becoming representative for the county of Denbighshire, where he had been born. Trained at the Inner Temple, he was called to the Bar in 1661 at the early age of 24. He became an expert in handling gambling transactions and appeared to concentrate on seamier aspects of the law. He appears to have been good at his profession and advanced rapidly, becoming a King’s counsel in 1673. He was a Tory, anti-Catholic and giving strong support to the monarchy. Michael Martin may be interested in knowing that Sir John continued to have a successful career in politics after his embarrassments in the House of Commons in 1695. He died at the age of 80 with a wealth estimated at £60,000, an enormous sum in those days. Fred Cooke 22 May 2009. In 2009 Parliament asked the Speaker of the House, Michael Martin to step down, and attention was drawn by the media to the previous occasion when a similar momentous and historic decision had been taken. 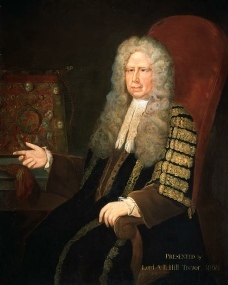 It was more than 300 years ago when the then speaker Sir John Trevor had been found guilty 'of a high crime and misdemeanour' namely taking a bribe of one thousand guineas from the London Council to ensure passage of a bill through the Houses of Parliament. This occurred in 1695.